The last few months have been hectic with work so I found it hard to take time out and do the things I enjoy. So this week, I made time for friends and for adventure and for bike rides. It also helped that Vancouver has been sunny for days so it’s been easy to meet up with friends and take some time out for myself without needing to bring along an umbrella. To say that this past week was fun is an understatement. It’s been awesome. And by way of an introduction, so is this meal. I made this a few weeks ago, but I’m already thinking that it’s time for a repeat. It’s spicy and warming and perfect on nights when there’s a chill in the air. Fall is here and we’ve been tempted to turn on our heat (but so far, we’re resisting). This would make an ideal warm-up dinner. We’re lucky to still get some nice looking tomatoes from our csa (though I doubt we’ll see any more to come as we got our first bit of frost this week), so I chopped up some nice golden heirlooms and reduced them down with some onions and garlic. A spoonful of my favorite curry paste bumps up the spice. Yogurt, coconut milk and a dollop of mango chutney get involved as does some zucchini. If it’s hard to find zucchini now, try subbing in some colourful peppers or get all up in autumn’s grill and add in some roasted butternut or acorn squash or even some sweet potatoes. Really, I think that would be just grand. If you think it’s easy to screw up shrimp, give this meal a try because I think it’s almost impossible to cook them badly here. Just make sure that adding the shrimp is the last thing you do. 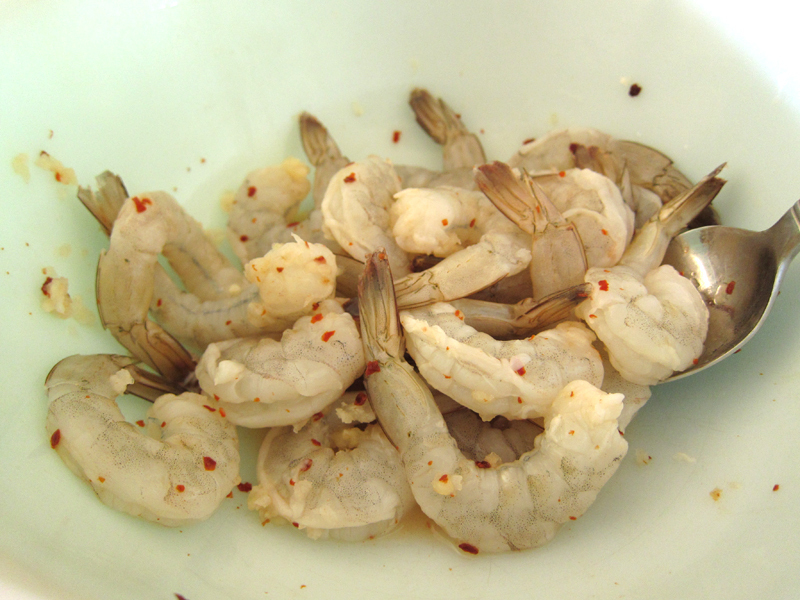 The lime & chili marinated shrimp only need 2 minutes to cook, so once the sauce is prepared, the rest is a breeze. I served this over coconut rice which is a heck of a lot easier to prepare than it sounds. I just took the leftover coconut milk from the sauce and dumped it into the pot of cooked rice. It’s not overly coconutty, but it made the rice creamy and worked really well with this dish. Ta da! Dinner is served. In a large skillet, heat oil over medium heat and add in onion. When the onion gets fragrant & translucent, add in the green onion and garlic and stir it around with a bit of salt. Add in curry paste and the tomatoes and cook down until the tomatoes get soft, about 10 minutes. Meanwhile, In a medium bowl, add the shrimp, garlic, pepper, salt and lime juice and let marinate for at least 15 minutes, stirring occasionally. Set aside. Back over at the stove, turn down heat to low and add in yogurt, sriracha, mango chutney, half the can of coconut milk and the zucchini into the tomato curry mixture. Stir well and let simmer for 5 minutes. 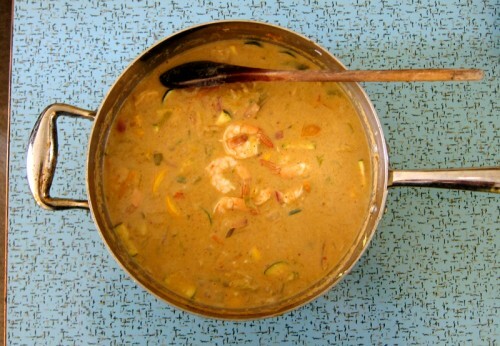 Turn back up the heat to medium-high so the mixture starts a slow bubble and pour in the shrimp mixture. Stir so that the shrimp is coated in the curry and let cook for 2 minutes until the shrimp is pink. Meanwhile, add a half can of coconut milk to your hot rice and stir well. 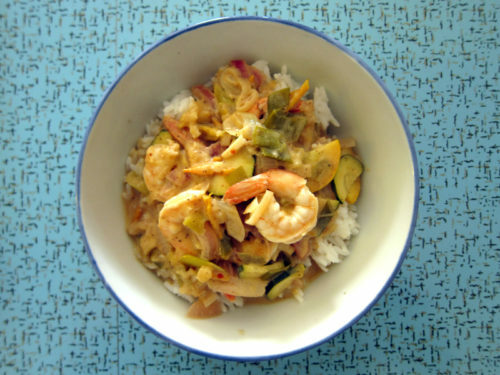 Serve masala shrimp over coconut rice. Serves 4. Yum. This looks like a delicious and warming dish for these cool days. I’ve never come across the technique of pouring coconut milk over hot rice before. I’m guessing it makes it quite soupy. Is this something you’ve seen before or your own invention? Delyth, I usually use a whole can of coconut milk if I’m making curry, but I realized after adding just half the can that it seemed to be at a good liquid state, so I didn’t add in the rest. So when I spied my hot rice all ready, I just figured I’d pour it in & no harm would be done. Because it was only a half can, it absorbed into the hot rice, so it wasn’t soupy at all. Necessity is the mother of invention, after all! I totally feel you on getting overwhelmed with work. I find it so important to set aside some time for fun. Whenever I dedicate an afternoon to a good walk or a bike ride, I always feel like the life has come back to me. This looks like a fantastic, warming meal. I’ve been resisting the call of the heat as well and the only real solution is to make tons of warming dishes like this. Love how easy it is! And go you for doing things you love! YUM. Definitely making this soon! Bijoux, it’s a good one! And I totally know that song, of course. Aw thanks Joanne for your nice words. Thanks Kate, it’s a tasty meal! I made a variation on this yesterday! It ROCKED! I substituted tofu for shrimp (the marinade still worked) and unfortunately I had to omit the mango chutney… Mangoes are hard to come by in my current country and the only jar of mango chutney I could find listed ‘mango’ a little to far done the ingredient list. Glad to hear you enjoyed it, Light in the Attic! And I’m sure it was delicious with tofu – I like the mango chutney because it gives this dish a bit of sweetness, but it’s not needed. Wow – so up my alley! Will definitely be making this! Julie, it’s a tasty meal, enjoy! Oh my, this was so tasty. I found the aleppo pepper labelled as Turkish pepper at my local Middle Eastern grocery store. What a discovery. My husband has been known to choke on hot pepper flakes “hidden” in dishes, but I had him sampling this stuff straight out of the jar. It is going to be my new go-to hot pepper. 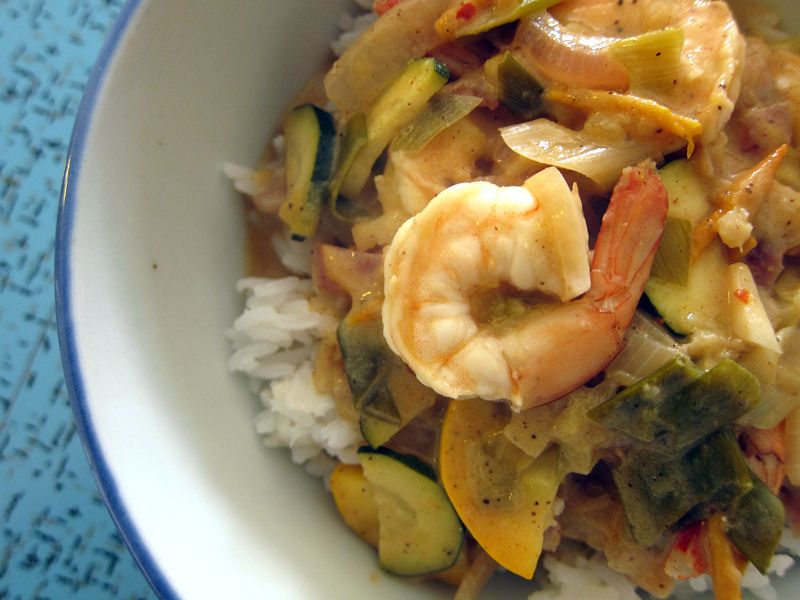 I also loved the idea of adding the coconut milk to the rice – I used Thai jasmine. It didn’t make it soupy at all. Instead of using light coconut milk, I just thinned about 2/3 of a regular can with water and froze the rest. Three very happy diners practically licked their plates clean. I have to tell you how delighted I am to have discovered your blog. I look forward to trying lots and lots of your recipes. Can’t wait to try the roasted broccoli and shrimp now. Made this precisely as written and enjoyed it. Judy had a second portion and thought it was delicious, which is rare. When you publish the book, put the marinade step first, so cooks don’t have to stop and wait. I’ve noticed aleppo pepper in a lot of your recipes, it’s a great spice, but I think its fruitiness was lost against all of the other strong flavors. Robert F, I think you discovered my secret that I’ve actually been out of black pepper for a couple months now and only restocked my pantry recently. I was using aleppo as a very tasty sub. Glad you liked the recipe and yes, great idea on switching up the recipe to include marinating first. can i use masala curry powder instead of paste? thanks!